Pavers are durable and long-lasting. 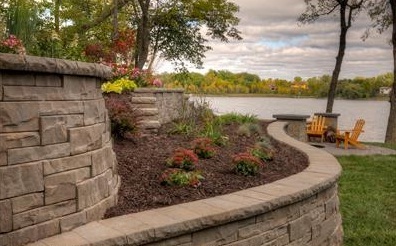 Pavers add creativity to the landscape with many colors, textures and patterns. Pavers are easy to maintain. 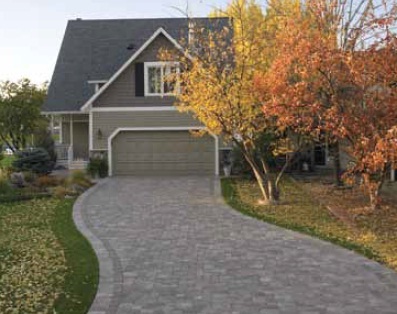 The first thing the eye registers when you look at a concrete paver driveway is its beauty. But beneath the beauty lie the pavers, which are made of precast concrete that has a compressive strength of 8,000 psi (pounds per square inch) – that’s about three times stronger than a poured concrete surface. So homeowners enjoy a handsome upgrade to the driveway with the assurance that the surface is designed to withstand vehicle traffic and years of use. Concrete pavers can be designed and installed to make a statement. 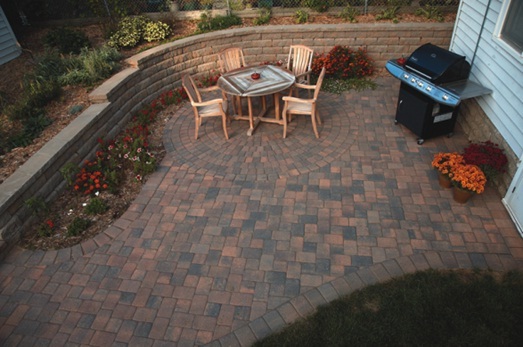 Use different colored pavers to create zones or outdoor rooms. A contrasting color makes a striking border, also known as a sailor or soldier course, around the perimeter of the area. 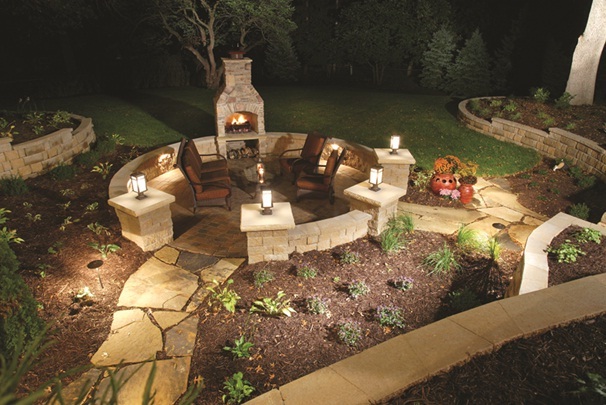 Paver circle kits can define a space such as an entry way, or create an intimate seating area with a fire pit in the center. 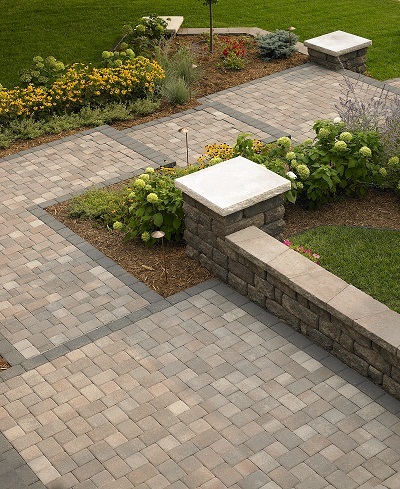 Pavers are available in a variety of shapes, sizes, and in many colors that blend well with outdoor environments. You can also choose from a variety of textures. 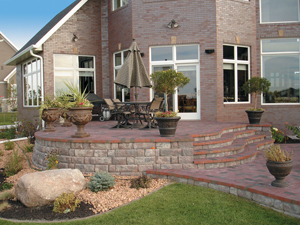 Tumbled pavers have softened edges and provide an appealing time-worn appearance. Traditionally styled pavers have a smooth texture and are versatile because they complement many environments. The newest concrete pavers have the beautiful texture of natural stone combined with a flat back for easy installation. Concrete pavers are perfect for creating pathways that connect and define. Using pavers as a path to a fire pit or spa not only provides practical access but preserves previous space for plants. 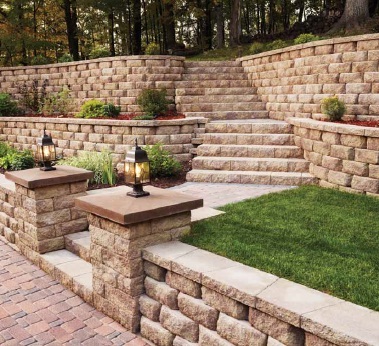 In a yard with elevations, concrete pavers used as landings between staircases provide safe access to different elevations and create more space for seating or other uses on the slope. Unlike wooden decks that require staining or ceramic or stone surfaces that may require sealing, concrete pavers require little maintenance. Occasional sweeping or spraying with a garden hose is all that’s needed for cleaning. If food or oil leaves a spot, use a pressure washer and a mild dishwashing detergent. If an individual paver becomes broken, the unit can be easily replaced without a noticeable patch by removing the paver, re-grading and re-compacting the base and bedding sand and installing a new paver unit. A key benefit of using pavers is that the newly-installed surface is ready to use immediately after installation; there’s no curing or drying time. Many homeowners prefer to hire a contractor who has experience installing pavers as well as the necessary equipment and labor force. Do your research by calling several contractors to look at your proposed project and ask for references to contact after a design and bid have been submitted. Pavers can also be installed by do-it-yourselfers. There are pavers, materials, tools and information available at major home centers and independent lawn and garden dealers. Check our website for a list of landscape retailers and dealers near you.